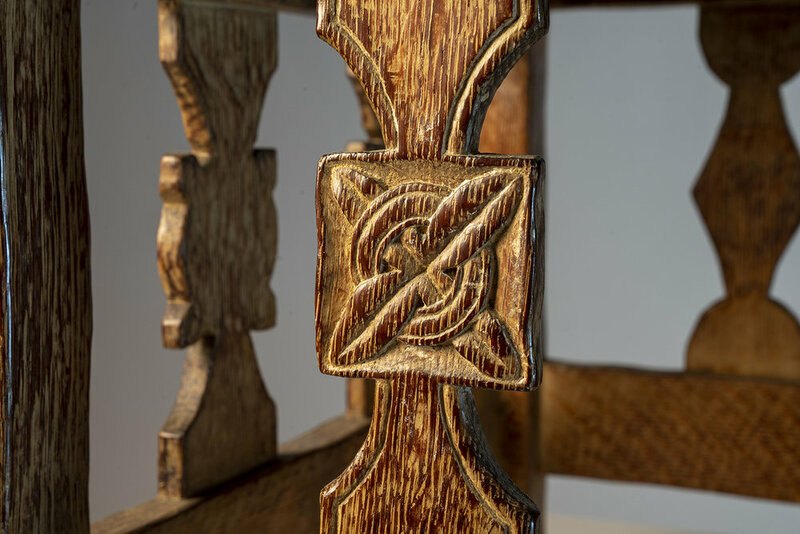 There is so much artwork to appreciate at Glencairn that visitors often pass by a certain elaborately-carved oak chair on the first floor without giving it a second glance. The chair was inspired by a twelfth-century Norwegian chair that was rediscovered in the late nineteenth century in a church in the village of Tyldal. The nineteenth century saw a revival of interest in woodcarving influenced by Norwegian Viking art, which became known as “dragon style.” Glencairn’s chair (see photo above), hand carved in the Bryn Athyn woodworking shop in the 1920s, is significant—not only for the high quality of its workmanship, but for the story it tells about the circumstances that led to its creation. Three similar chairs, made at the same time, reside today in the upper chancel of Bryn Athyn Cathedral. Figure 1: A side view of Glencairn's "Tyldal chair." The intricate design on the right vertical spindle was copied from the original twelfth-century Norwegian chair. In 1927 Raymond Pitcairn, who had been supervising the construction of Bryn Athyn Cathedral since ground was first broken in 1913, was thinking about ecclesiastical furniture for this magnificent Gothic- and Romanesque-style complex. The woodworking shop adjacent to the Cathedral had been built more than a decade earlier, and he now wanted to produce hand-carved, medieval-style chairs for the clergy. Pitcairn asked his secretary to write to the American-Scandinavian Foundation in New York City, inquiring where he “might obtain photographs or illustrations of early Scandinavian woodcarving, that would go back to the Viking period—in the way of furniture, ship ornamentation, doorways, etc.” (Marie Fredette to American-Scandinavian Foundation. 3 September 1927). She wrote that the carving was to be used “in some of the work at the [Bryn Athyn] Cathedral.” The Foundation sent Pitcairn a variety of publications and photographs, which may or may not have been useful to him. However, the main inspiration for the design of these chairs came from another publication found later among Pitcairn’s papers. The basic structure of all four of these oak chairs was inspired by the so-called “Tyldal chair,” a Norwegian “church chair” from the 1100s (Figures 2-4). Pitcairn’s papers, now in the Glencairn Museum Archives, include a copy of “Early Scandinavian Wood-Carvings” by J. Romilly Allen, published in 1897 in The Studio, a London-based Arts and Crafts magazine. According to Allen, “the best examples of carved woodwork now surviving in Scandinavia are derived from the ancient timber churches of Norway, chiefly doorways and ecclesiastical chairs” (14-15). 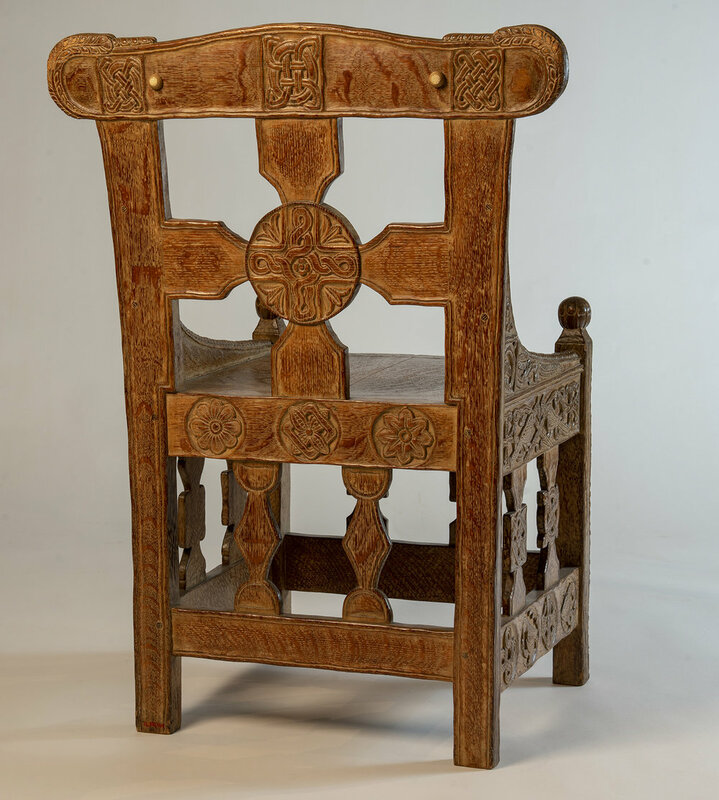 One of the examples in Allen’s article was an ecclesiastical chair originally discovered in a church in the village of Tyldal in Norway’s Østerdalen district. Fortunately for Pitcairn, the article included detailed photographs of all four sides of this chair. Figure 2: The original twelfth-century Tyldal chair, photographed in the Medieval Exhibition Room (middelalderutstillingen) at Kulturhistorisk Museum, Oslo, Norway. Photo © User: Wolfmann / Wikimedia Commons. Figure 3: A detail of the back (front side) of the original Tyldal chair, photographed in the Medieval Exhibition Room (middelalderutstillingen) at Kulturhistorisk Museum, Oslo, Norway. The chair back consists of a square cross anchored by a central medallion. The design on the top arm of the cross was copied in the Glencairn chair. Photo © User: Wolfmann / Wikimedia Commons. Figure 4: A detail of the front of the original Tyldal chair, photographed in the Medieval Exhibition Room (middelalderutstillingen) at Kulturhistorisk Museum, Oslo, Norway. The design at the center of the front vertical spindle (the right one is missing) was copied in the Glencairn chair. Photo © User: Wolfmann / Wikimedia Commons. The “Tyldal Chair” had originally been published by Nicolay Nicolaysen, the archaeologist who found the chair in 1878 and “arranged for the chair to be sent to the Universitetets Oldsaksamling in Oslo, and published it in a long article, illustrated with detailed drawings, which appeared in the Museum’s Yearbook for 1879” (Dorothea Fischer, “Tyldalstolen,” in Viking: Tidsskrift for Norron Arkeologi, Bind XXVI, 1963, 176). According to Dorothea Fischer, the “richly carved back shows that the chair stood free—had it been a king’s high seat, it would have stood up against a wall. Thus our thoughts turn to the foundation of the Archdiocese of Nidaros (Trondheim) in 1153. From there, our imagination need not roam far to allow us to see the magnificent chair in the cathedral—a fitting throne for Norway’s first archbishop” (Ibid., 177). Today the chair resides in the Kulturhistorisk Museum in Oslo, where it is on public exhibition. A detailed examination of the carvings on Glencairn’s chair shows that three of the decorations are copied directly from the photographs available to Pitcairn in the 1897 issue of The Studio. These three carvings occur in the same places on the Glencairn chair as they do on the original Tyldal chair: two are on the front side, and one is on the right side (see photographs). Although these three decorations are direct copies, they still bear the subtle differences to be expected in the different woods used for the two chairs—birch for Tyldal and oak for Glencairn—and in the individual styles of the carvers. Glencairn’s chair appears to have been a prototype for the three chairs now at the Cathedral, which exhibit certain similarities in decoration with the Glencairn chair, but also many differences. As an “experiment,” the Glencairn chair may never have been delivered to the Cathedral. Eventually it found a permanent home at Glencairn, which was completed in 1939. Figure 5: Glencairn's chair back (front side). Like the original Tyldal chair, a square cross is anchored by a central medallion. The upper arm of the cross has a design that was copied directly from the original Norwegian chair. Figure 6: Detail of a design on the back (front side) of Glencairn's chair. Figure 7: Front of Glencairn's chair. The design at the center of the left vertical spindle is copied from the original Tyldal chair. Elements of the design on the bottom stretcher of Glencairn's chair, especially the feather-like carvings, also exhibit some similarities to the original. Figure 8: Detail of the design at the center of the left vertical spindle on the front of Glencairn's chair. Figure 9: Right side of Glencairn's chair. The design at the center of the right vertical spindle is copied from the original Tyldal chair. Figure 10: Detail of the design at the center of the right vertical spindle on the right side of Glencairn's chair. 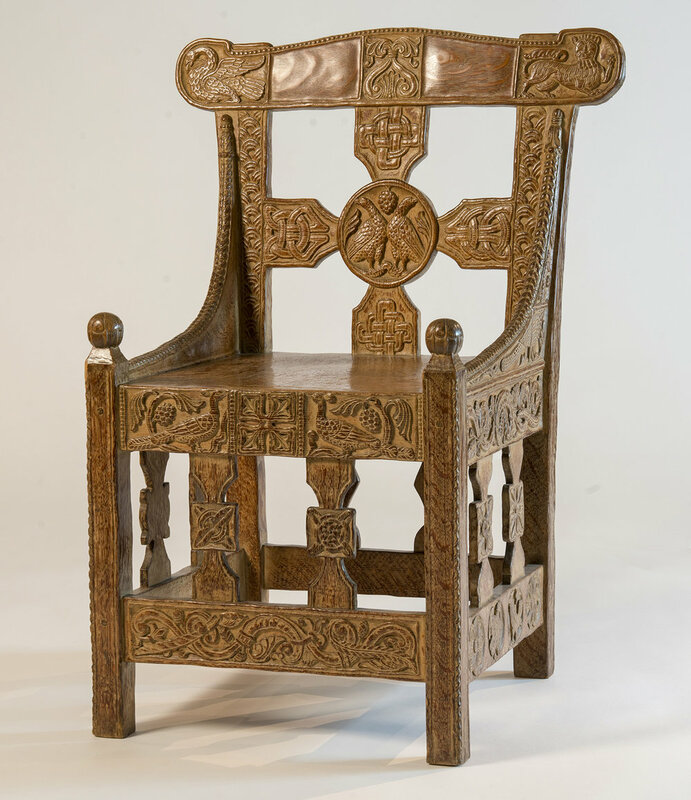 Glencairn’s Tyldal-style chair has been attributed to Frank Jeck, a woodcarver from Hungary who worked for Pitcairn on both the Bryn Athyn Cathedral project and later Glencairn. Jeck was a talented craftsman who both designed and executed his work. A cherrywood crib he carved in 1922 for Lachlan, the infant son of Raymond and Mildred Pitcairn, has been exhibited in several major Arts and Crafts exhibitions. Figure 11: Both sides of the Glencairn chair have a woven design that is similar to the Tyldal chair, but not an exact copy. On the right side of the photograph the woven carving terminates at the top in a foliage-inspired design, whereas the original Tyldal chair terminates in elongated dragon heads. 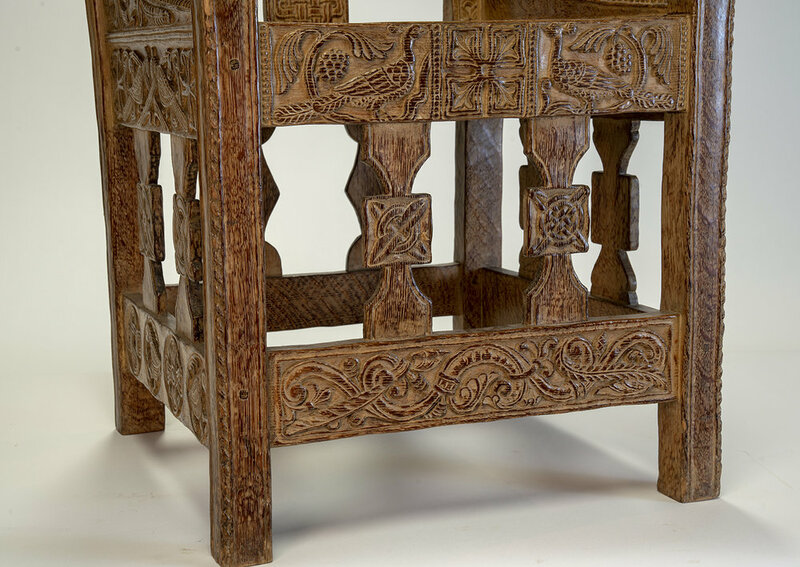 Figure 12: The right side of Glencairn's chair features a variety of carvings, including a turkey and a rooster, but no specific designs were copied from the Tyldal chair. Figure 13: The back of Glencairn's chair. An archival note in Pitcairn’s own handwriting indicates that these Tyldal-style chairs were originally intended for Bryn Athyn Cathedral’s Council Hall, the south wing of the building intended as a space for the clergy to hold meetings. However, only three chairs (not including the Glencairn chair) in the Tyldal style were ever made (Figures 14-19). Four other ecclesiastical chairs, featuring religious imagery connected to the Academy of the New Church schools in Bryn Athyn, were also produced in the woodworking shop. These, too, were carved by Frank Jeck, but they are more elaborate in design. Together with the three Tyldal-style chairs, they may be seen today in the Cathedral’s upper chancel. At some point Pitcairn had the chair now at Glencairn, and also some of the Cathedral chairs, photographed in the woodworking shop, resting on an oriental rug (Figure 20). Figure 14: Three Tyldal-style chairs from Bryn Athyn Cathedral. The chair on the right is most similar in construction to Glencairn's chair. The two chairs on the left are slightly taller and have three front vertical spindles instead of two. 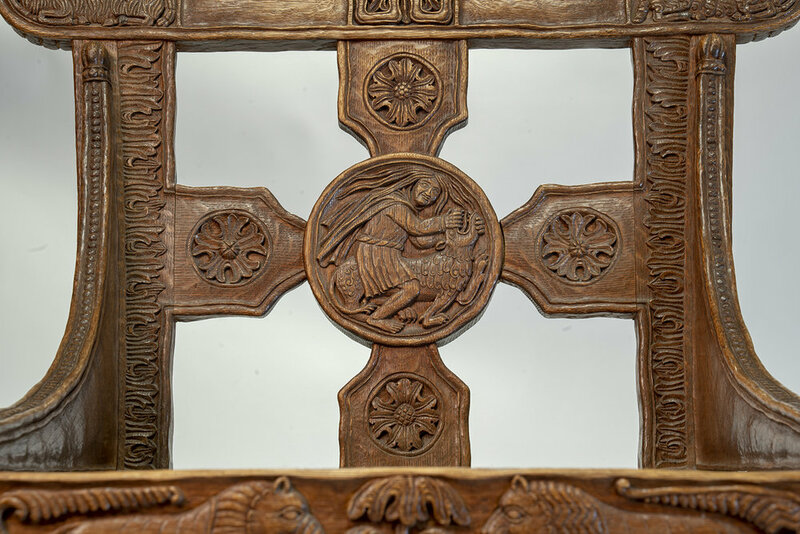 Figure 15: Bryn Athyn Cathedral Tyldal-style chair with a depiction of Samson slaying a lion (Judges 14:5) on the central medallion of the chair back (front side). Figure 16: Bryn Athyn Cathedral Tyldal-style chair with two lions facing each other on the chair apron. This chair also features a depiction of Samson slaying a lion (Judges 14:5)on the chair back (front side). Figure 17: Bryn Athyn Cathedral Tyldal-style chair depicting a shepherd and his sheep. This chair also features a depiction of Samson slaying a lion (Judges 14:5)on the chair back (front side). Figure 18: Bryn Athyn Cathedral Tyldal-style chair depicting a lion. This chair also features a depiction of Samson slaying a lion (Judges 14:5) on the chair back (front side). 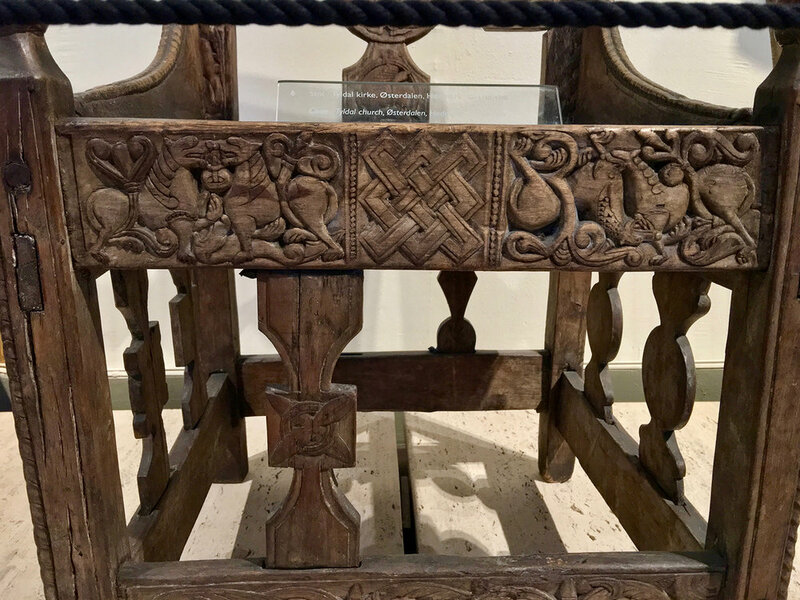 Figure 19: Bryn Athyn Cathedral Tyldal-style chair depicting a lion's head on the crest rail. Figure 20: At some point after it was carved, Glencairn's "Tyldal chair" was photographed in the Bryn Athyn Cathedral woodworking shop with an oriental rug as a backdrop. Several of the Cathedral's chairs were photographed as well. This archival photograph (#3875) comes from a collection of glass negatives in the Glencairn Museum Archives. Raymond Pitcairn was not alone in his desire to reproduce the original twelfth-century Norwegian Tyldal chair. In 1901 the Victoria and Albert Museum in London, England, purchased an exact copy of it. Another copy was photographed in the “Red House,” a house owned at one time by William Morris, one of the founders of the British Arts and Crafts movement. However, the photograph of the chair in the “Red House” was taken shortly after Morris had moved out, when the house was owned by Charles Holme. Holme was the founder of The Studio, the Arts and Crafts magazine that had published the 1897 article about Scandinavian carving consulted by Pitcairn. It is possible that Morris had originally owned this copy of the chair, but it is also possible that Holme, who had published the chair in his magazine, arranged to have a replica made for himself. 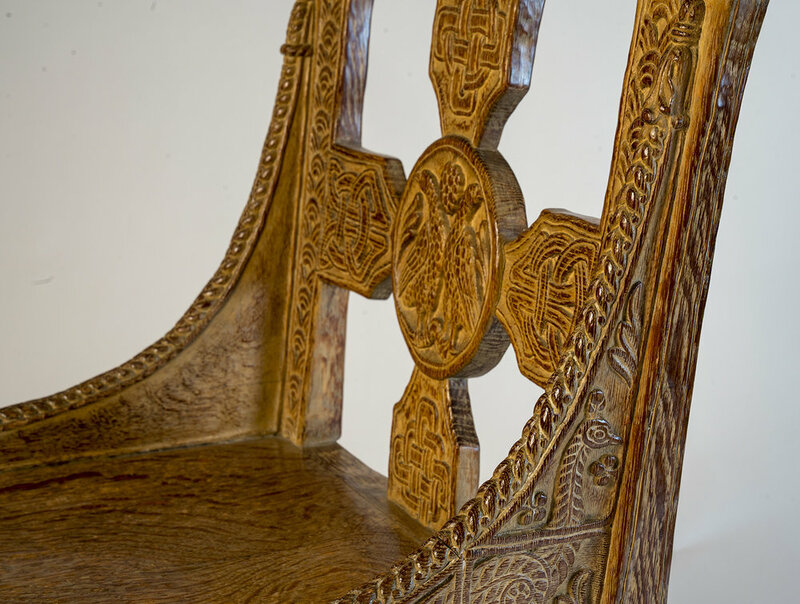 Arne Jacobsen, the Danish furniture designer, famously remarked, “People buy a chair, and they don't really care who designed it.” In the case of Glencairn’s “Tyldal chair,” we are fortunate to know, not only the historical inspiration behind the design, but also the names of the man who commissioned the work and the actual woodcarver. Photography of the chairs in Glencairn Museum and Bryn Athyn Cathedral courtesy of Edwin Herder.